The thirteenth installment in Stephanie Barron's fan-favorite Being a Jane Austen Mystery series. Between novels, Victorian England's most beloved author doubles as a sleuth in often idyllic locales. November, 1815. The Battle of Waterloo has left the British economy in shreds; Henry Austen, Jane's favorite brother, is about to declare bankruptcy. The crisis destroys Henry's health, and Jane flies to his London bedside. While she is there, the Reverend James Stanier Clarke, chaplain to His Royal Highness the Prince Regent, invites Jane to Carlton House, the Prince's fabulous London home. Jane only accepts because many of Henry's bad loans were given by the Prince Regent's cronies. 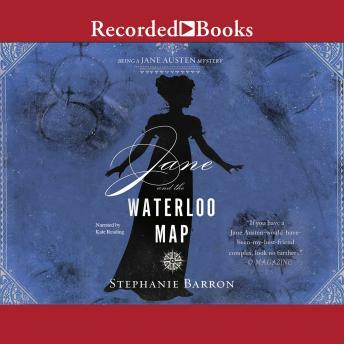 She hopes to intercede with the Regent on Henry's behalf, but before she can speak to him, she stumbles upon a dying man in the library--Colonel Ivor MacFarland, who with a knife in his entrails utters a single failing phrase: the Waterloo map . . . and Jane is on the hunt for a treasure of incalculable value, and a killer of considerable cunning. "[A] good double closed house mystery and an engaging historical novel, with careful descriptions of Georgian Christmas customs." --Booklist Stephanie Barron was born in Binghamton, New York, the last of six girls. She attended Princeton and Stanford Universities, where she studied history, before going on to work as an intelligence analyst at the CIA. She wrote her first book in 1992 and left the Agency a year later. Since then, she has written sixteen books. She lives and works in Denver, Colorado.